The Coveo Platform includes a super user access feature. Super user access is typically granted in exceptional cases to allow an authorized user to perform searches on secured content to which he normally does not have permissions to access. Example: A member of the legal department is granted a temporary access to the full enterprise indexed content, including all employees emails, so he can gather documents related to a legal issue. A super user access bypasses all security checks normally performed on the Coveo Platform. Your Coveo administrator can grant access to all indexed content to a specific authorized user, but not to a group. With super user access, the granted user can search all the documents in the index, including documents to which he would normally not have access to. The super user access privileges allow broader content access for aiding in internal investigations and compliance, with full auditing capabilities. Note: The availability of the super user access feature is subject to the Coveo license terms (see Managing Super User Access). Important: For security reasons, all super user access related events are recorded, traceable, and can be audited. The Coveo Platform records who grants super user access to whom as well as all queries performed with a super user access. The Coveo administrator must also set an expiration date and can revoke the super user access at any time, but cannot delete traces that it was granted and traces of its usage. 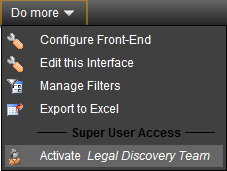 When the Coveo administrator has granted you super user access, in the search interface, click the Do more menu. Important: Note that for security reasons, all super user access related events that you will perform will be recorded, will be traceable, and can therefore be audited. Under Super User Access in the menu, select Activate <your_super_user_account>, the super user access that was granted to you. Note: If the Super User Access section does not appear, you do not have super user access on this search interface. Contact your Coveo administrator for assistance. A message appears at the top of the results to remind you of the privilege access that you are using. At the end of each super user access session, deactivate the super user access by selecting Deactivate <your_super_user_account> on the Do more menu.